One of the most fascinating, colourful and uplifting experiences we enjoy during our Turkish Aromatic Odyssey is visiting a beautiful 13th century Caravanserai where we witnessed Sufi holy men also called "Whirling Dervishes", enacting the devotion of Sema which in the Sufi religion represents man's spiritual ascension through mind and love to reach perfection ( Kemal ). 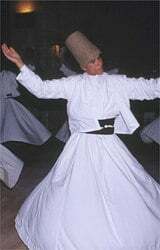 Sufism was created in the 13th century by the Islamic mystic Mevlana Celaleddin-i Rumi who believed that the natural state of all things is to revolve, and during the Sema the devotees go through a mesmerizing twirling dance containing four ritual salutes each representing different stages of awareness. 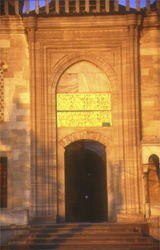 We were privileged to experience an authentic and very moving ceremony full of quiet devotion to the belief that by deserting ego and turning towards truth and perfection with loving intent, the dancers are conveying God's spiritual gift and embracing all of humankind and creation with affection and love. It was a truly amazing and moving experience.